Let your conference participants be part of the meeting and share their thoughts. There's no hassle, no registering and no sharing with the outside world. This sparks immediate audience engagement and gives you insights like never before. Follow up on actions afterwards - no more Post it notes. 1. Download An App - Participants are asked to download a simple app from Google Play/AppStore and use it to write and send anonymous messages. 2. The Messages Show Up In Your Feed - All messages are shown in a simple list where you can search for phrases, select specific messages that stand out, download to Excel and much more. 3. Made For You - Planning an event is a time-consuming endeavour, and things need to work. 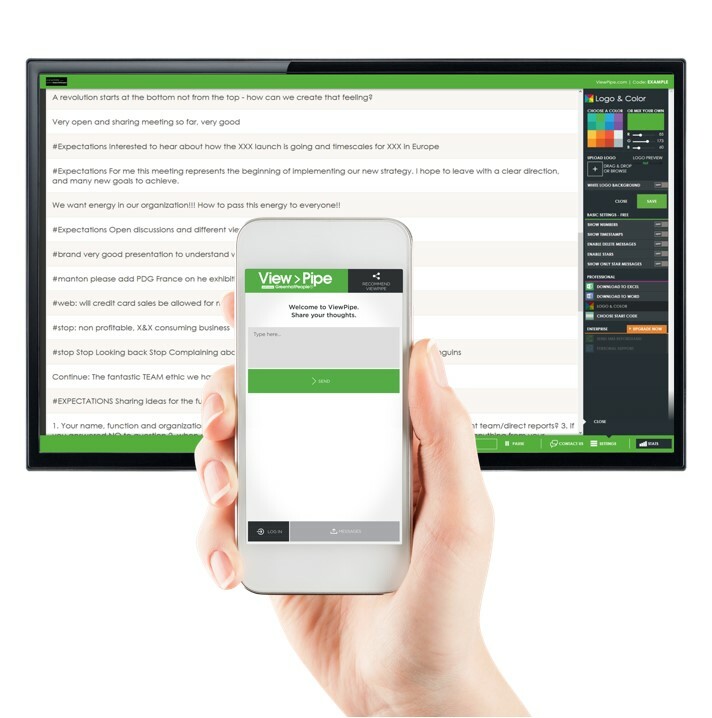 ViewPipe is designed with simplicity and trust in mind; it will take you minutes to get started, it's impossible to misunderstand and it works, every time. Why choose our event app? We focus on being the simplest solution available. No fancy features that no one uses, just the important stuff - a text field and a big SEND button. We’re a company called Green Hat People, and we're about meetings that stick. Meetings that motivate, engage and electrify! When employees know where their organization is headed, they feel inspired. When they’re invited to participate, not just spectate, they feel engaged. And nothing is more important for your business. Love it! Very good to both engage and inform. Love the internal possibilities this gives. We reached a new level of interaction and the guests were impressed - exactly what I wanted to achieve! How much does ViewPipe cost? Can your staff help out? Get closer contact with the content of exhibitions and stands in a fun and engaging way. Customized to suit your agenda and needs.